Replaceable workers or productive workers? CEOs of American companies complain of a lack of skilled workers and the lack of job training. But if you look at what most of them do, and not what they say, they don’t really want productive workers. They want replaceable workers. 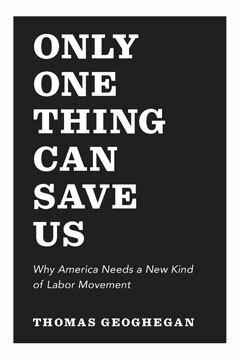 So argues Thomas Geoghegan, a Chicago labor lawyer, in his outstanding new book, ONLY ONE THING CAN SAVE US: Why America Needs a New Kind of Labor Movement. One obvious example of this is Boeing’s decision to have its new Dreamliner made by inexperienced, low-paid workers in South Carolina rather than members of the International Association of Machinists in Seattle. They had production and quality problems in South Carolina, but their priority evidently was to get away from the union. Now the same management philosophy is being applied to public schools, universities and hospitals. Well-trained, well-paid professionals are harassed, laid off and replaced with inexperienced newcomers. If you define efficiency as that which is most convenient for managers, there is something to be said for this. An ignorant subordinate is less likely to give you an argument than an experienced and skilled subordinate. It is easier to treat people as replaceable parts if they lack knowledge and opinions. And cutting jobs and wages can free up money for executive bonuses and shareholder dividends if your time horizon is limited to the next fiscal quarter. I remember reporting on business in Rochester, N.Y., in the 1980s and 1990s. In the 1980s, I reported on efforts by Kodak, Xerox, General Motors and other large companies to adopt the Deming worker-oriented management philosophy. By the 1990s, that had mostly gone away. Big manufacturers turned to outsourcing, off-shoring and two-tier wage systems. This didn’t solve their problem. Now decisions about American industry are made neither by worker-management teams nor by industrial engineers. They’re made by financiers. This is a broad generalization, and of course, in a country as big as the USA, there are many exceptions. But I think this is the way things are going. But American prosperity requires a healthy middle class. If the prevailing management philosophy is to seek short-term profit by driving down wages, then in the long run there are will be customers for the products of American industry aside from a tiny economic elite. That’s why, as Geoghegan wrote, that only a strong labor movement can save us. Organized labor is the only thing that stands between the American middle class and the slide to the bottom. Bringing Labor Back by Chris Miasano for Jacobin. Let Old Labor Die by Jeremy Gantz for In These Times. Why Workers Won’t Unite by Kim Phillips-Fein for The Atlantic. A Shaky Solidarity by Michael Kazin for Bookforum. A More Perfect Union? by Thomas A. Kochan for Stanford Social Innovation Review. This entry was posted on April 7, 2015 at 10:51 am and is filed under Books, Labor. You can follow any responses to this entry through the RSS 2.0 feed. You can skip to the end and leave a response. Pinging is currently not allowed. The economy is a system (kind of like the human body). We are all in it together. What is good for each part, is good for the whole. I’m going through that right now. The company I work for has quit paying shift differentials and weekend differentials. It means, for a nursing assistant (CNA), a difference of nearly $3000 per year in terms of wages. They have also cut staffing. Sunday we had SEVEN falls in about 12 hours. Why? Because they’ve cut nurse staffing as far as they can, so now they are cutting CNA staffing. A wing that used to have 4 CNA’s during the day, 3 in the evening, and 2 overnight now has 2 during the day and evening and one overnight. We’re talking for 38 patients. And it’s getting worse, they took away the coffee makers and got rid of one of the patient refrigerators on the rehab side of the building. They are writing people up if they don’t take their mandatory 30 minute break so many people, nurses and CNA’s alike, are clocking out but continuing to work because they can’t afford to lose their jobs. Would you want your parent to be a patient in this facility? Would you want to be?